On Saturday, October 11, Disney Store will celebrate the grand opening of its new store at St. Johns Town Center in Jacksonville, Florida. A premier retail destination, Disney Store offers a unique, high quality selection of Disney, Marvel and Star Wars product while delivering a magical and immersive shopping experience through its Cast Members, who are dedicated to making every Store visit memorable. Complemented by DisneyStore.com, which is available 24 hours a day, Disney Store’s signature design features storytelling elements that allow guests of all ages to interact with their favorite characters in unique ways. Unique to the St. Johns Town Center location, as guests enter the store and look above, they will see a customized skyline incorporating local landmarks, classic Disney features and magical storytelling moments. The Pixie Dust Trail guides guests through “Storytelling Neighborhoods” featured on either side of the path, highlighting favorite Disney, Marvel and Star Wars characters. The Disney Princess Neighborhood is home to the Disney Princess Castle, bringing the stories of the brave, kind and adventurous Disney Princess characters to life through costumes, accessories, dolls and more. Disney Store’s signature Magical Trees line the Pixie Dust Trail, and are an integral part of the immersive storytelling experience, with iconic characters hidden throughout the overlapping patterns of blue foliage. The Disney Store Theatre is found at the end of the Pixie Dust Trail, where guests can choose from an ever-changing library of over 50 different clips consisting of Disney, Marvel and Star Wars film trailers, film clips, music videos, classic animation and more. To celebrate Walt Disney Animation Studios’ highly anticipated film, Big Hero 6, the St. Johns Town Center location and Disney Stores nationwide will offer an assortment of products featuring an all-new lineup of colorful characters. From action figures and apparel to electronic accessories, the Big Hero 6 product selection is also available online at DisneyStore.com so guests can shop their favorites anytime. And with Halloween just around the corner, the Disney Store in Jacksonville has guests covered with a wide selection of Disney, Marvel and Star Wars costumes and accessories. To make shopping easier and more convenient, Disney Store also launched its Halloween Shop in store and online, creating the perfect destination to browse favorite characters and styles. From the storytelling elements in the in-store design and exclusive product assortment, to Cast Members dedicated to making every Store visit memorable, Disney Store creates magical moments for guests of all ages. To help celebrate the new Disney Store, children from the local Boys and Girls Clubs of America will enjoy a special shopping experience prior to the grand opening, and Disney Store will make a donation of 10% of its merchandise sales revenue on Grand Opening day to the local chapter. Also, one lucky child from the chapter attending the grand opening will “unlock imagination” and officially open the St. Johns Town Center Disney Store location at 10 a.m. on October 11. This signature opening ceremony will take place every day, giving guests an opportunity to participate in an unforgettable Disney Store experience. Additionally, the first 500 guests to attend the grand opening celebration will receive a free gift, and from noon to 4 p.m. a Meet and Greet with Mickey Mouse and Minnie Mouse will take place in Phase lll Plaza, with an opportunity for guests to take photos with the characters*. To find a Disney Store location, guests can visit www.DisneyStore.com/storelocator or call (866) 902-2798. Guests can also sign up for email alerts at www.DisneyStore.com/Updates, become a fan on www.facebook.com/DisneyStore or follow us on Twitter www.twitter.com/DisneyStore to stay connected to your favorite destination. For more information, please visit www.disneyconsumerproducts.com/press/us. The Disney Store retail chain, which debuted in 1987, is owned and operated by Disney in North America, Europe, and Japan. 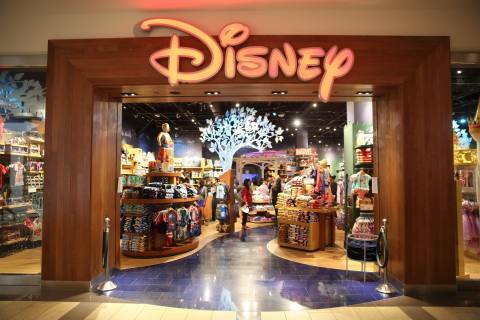 Disney Store is the retail merchandising arm of Disney Consumer Products, the business segment of The Walt Disney Company (NYSE:DIS) and its affiliates that extends the Disney brand to merchandise. Disney Store carries high-quality products, including exclusive product lines that support and promote Disney’s key entertainment initiatives and characters. Disney Store opened its first store in Glendale, California and, in doing so, originated the themed retail business model. There are currently more than 200 Disney Store locations in North America; more than 40 Disney Store locations in Japan; and more than 100 Disney Store locations in Belgium, Denmark, France, Ireland, Italy, Portugal, Spain and the United Kingdom, plus online stores www.DisneyStore.com, www.disneystore.co.uk, www.disneystore.fr, www.disneystore.de, www.disneystore.se, www.disneystore.dk, www.disneystore.it, www.disneystore.es and www.disneystore.co.jp. Each Disney Store location offers a magical shopping experience that can only be delivered by Disney, one of the world’s largest and most successful entertainment companies. For more information, please visit www.disneyconsumerproducts.com/press/us/disneystore or follow us at www.facebook.com/DisneyStore and www.twitter.com/DisneyStore.